At the beginning of the year – in a bid to take care of my skin and to have some ‘me’ time – I promised myself that I would treat myself to a facial once a month. Sadly, this promise only lasted January and it came down to the combination of either not having the time to go, the affordability of it, or if I was busy, the length of the treatment. 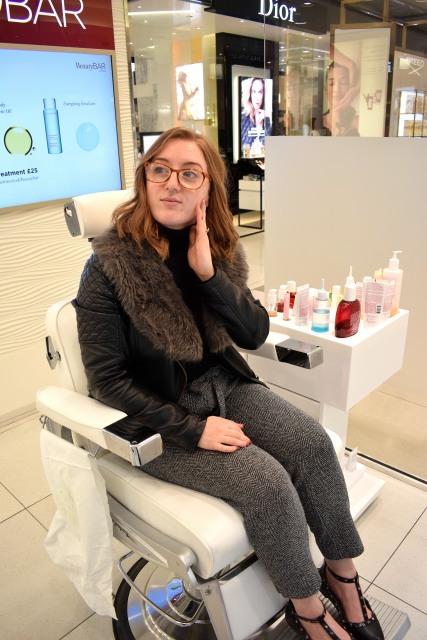 Now, thanks to the brand new BeautyBAR by Clarins in Fenwick Newcastle offering 30-minute treatments for £25, there’s no reason why I can’t treat myself every month. 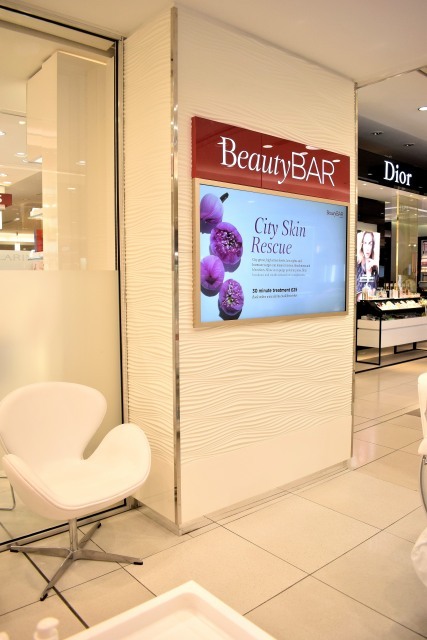 Launching in Fenwick Newcaslte on March 8th, the BeautyBAR by Clarins was inspired by the fast paced world we live in today where customers want the luxury of a treatment, but in double quick time. 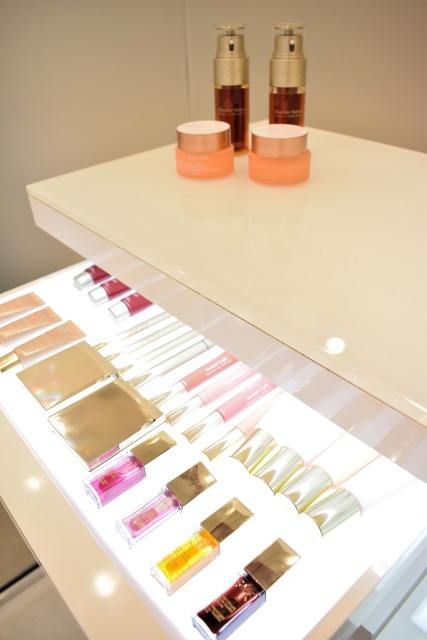 The stylish sister of the sophisticated, and popular, Skin Bar, which is located at the very back of the Clarins counter, the BeautyBAR by Clarins promises to deliver turbocharged, beauty boosting treatments in a relaxed environment with no compromise on luxury, or efficacy. These ultra-affordable, time maximising treatments use all the potent, plant-powered products and effective massage techniques you’d expect from other Clarins Spa Treatments – just cleverly condensed, so you’re good to go in double quick time. The treatment menu comprises of a selection of facials, as well as massages and limited edition seasonal treatments. There’s the Knot A Problem and Destress Express massages, as well as the Get Glowing, Firming Favourite, City Skin Rescue, SOS Facial and the Men’s Energiser Facial, and I definitely wanted the latter. During my 10-minute consultation, I discussed with the Clarins Beauty Therapist my skin type, what problems I’m having with my skin and the desire looked I want for my skin, and we both suggested the Get Glowing facial was just what I needed. The Get Glowing facial is a made-to-measure facial for fatigued faces and is set to rev up radiance within minutes. With expert circulation boosting massage combined with an optional fuss free application of Clarins’ self tan, this facial promises to leave skin looking post-holiday fresh. At the moment there’s nothing I love more than glowing skin and once I was sat in the BeautyBAR, I was very excited to get started. 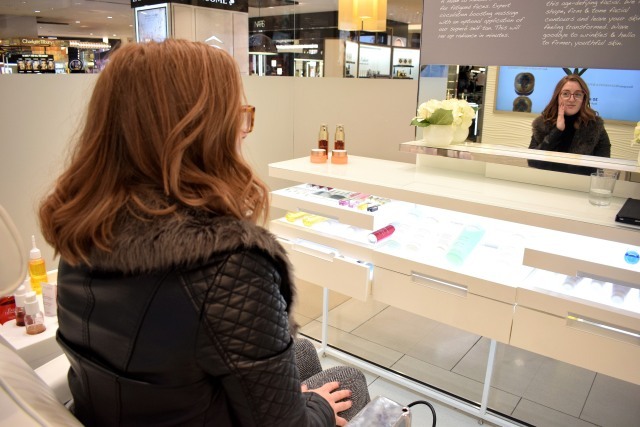 The BeautyBAR itself is stylish, sleek and modern space, which is tucked away from the hustle and bustle of the Fenwick Beauty Hall, and boasts a tranquil and calming atmosphere. As soon as I selected my treatment it was chair reclined, eye closed and ready to begin. The following 30 minutes seemed like pure heaven. You know when a treatment is so relaxing that you almost fall asleep? Yes, it was that good. I think it was down to the incredible facial and the fact that although the BeautyBAR is on the Clarins counter, it’s still very quiet allowing you to drift away. Clarins products are fueled by plant power and the main ingredients used in the Get Glowing facial are rice starch, which smooths the skin, kiwi, which boosts radiance and then finally aloe vera, which moisturises and hydrates. Last, but certainly not least, is a touch of Clarins fragrance. The moment this was applied my eyes lit up. The scent was absolutely incredible, I never knew Clarins fragrances smelt so nice. It was a fresh, clean, spa-like scent that I continued to smell for the rest of the evening. When I sat up not only did I feel incredibly relaxed, but my skin was glowing and it was super soft to touch. My skin looked bright and healthy, and even the day after my skin looked radiant. The facial was certainly the perfect little pick me up that I needed and at £25 for a 30-minute treatment I can’t wait to return for my next one. 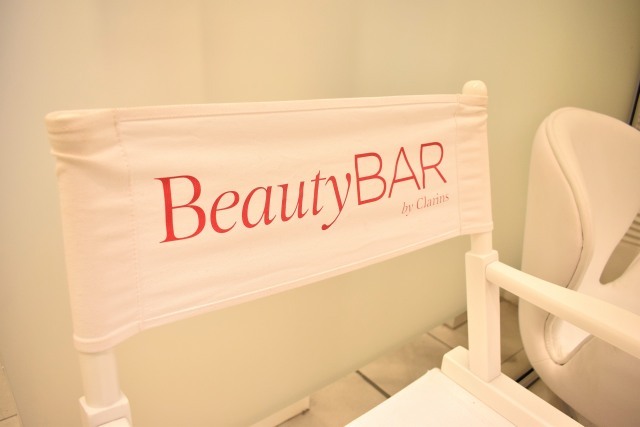 Have you been to the BeautyBAR by Clarins? Would you choose a massage, or a facial? 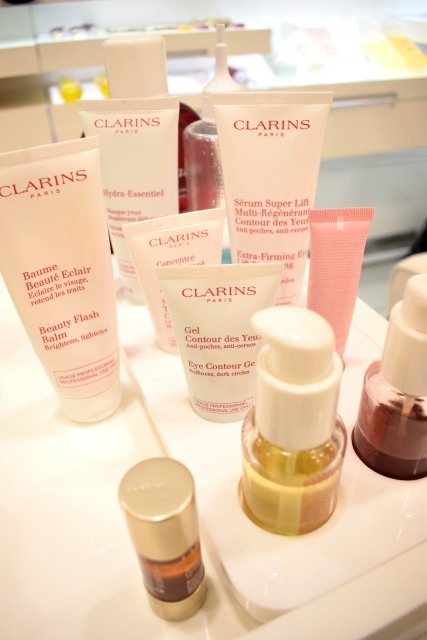 Have you tried any Clarins products before? 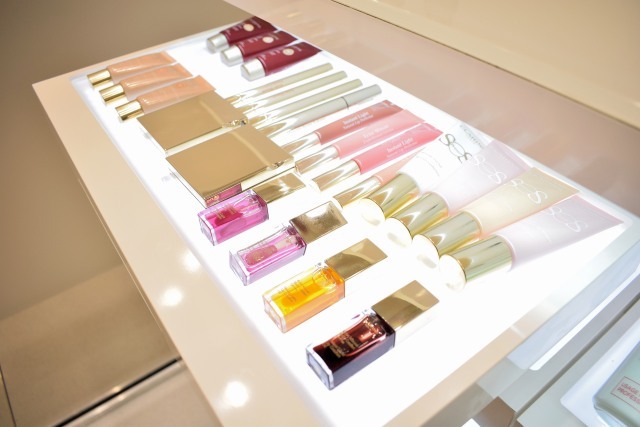 Obsessed with all things beauty? Find more make-up and skincare posts in my dedicated beauty section. Facial c/o Clarins in exchange for a review. This review is completely honest and my own thoughts and opinions. I love Clarins! Their skincare is so effective. I’ll definitely have to go for one of these facials. I’m similar int he way I always feel like I don’t have time or the money to get regular facials but this is such a good price for 30 minutes, it’s perfect. I’ll defo be needing a face massage after this week of exams! 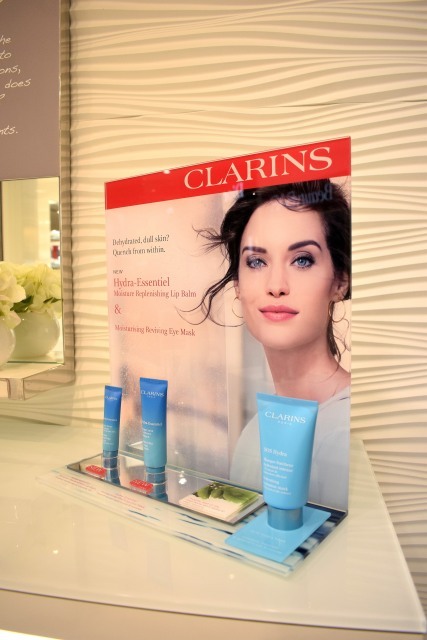 may take a trip to my local clarins stand! pamper day done right! 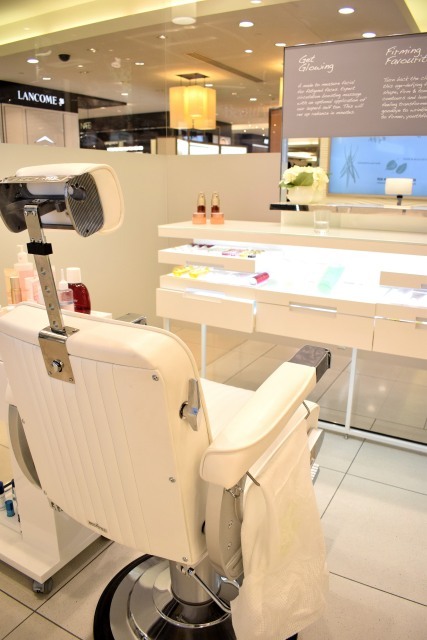 fenwicks is always my one stop shop for all things beauty and pampering! i adore clarins, it’s slightly out of my price range so when i really need to treat myself i always go for clarins! This looks amazing, I would deffo go for the facial! you can’t beat them and I love clarins!